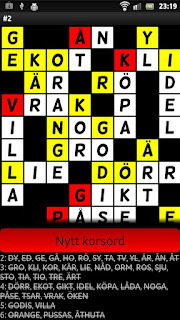 Crossword Puzzle, an Android game by developer Jonathan Jonsson, is a simple Swedish Crossword Puzzle game. It has the features that crossword enthusiasts would expect, a simple and easy to use interface, and even global leaderboards (powered by Swarm). It's also worth mentioning that there's a slight twist on the gameplay that makes it easier for new players to pick up. Players may choose words from a list that may fit. However, if the player incorrectly places a word, it will be struck out and it won't be possible to choose the word again. 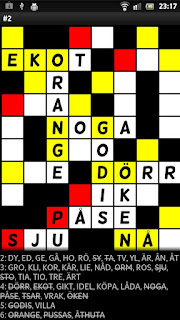 Crossword Puzzles in this Android game are 8 squares wide and 16 squares tall, which is a nice size for a mobile device. 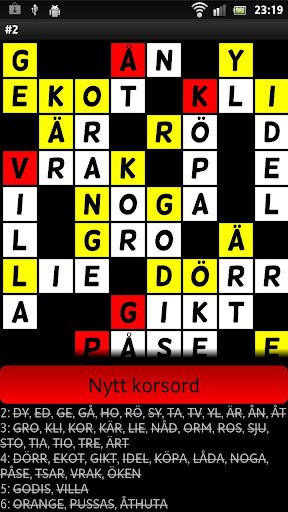 Also, the developer mentioned that new crossword puzzles will be added later on, which gives you even more value! If you like crossword puzzles and you need a new game for your Android device, then look no further than Jonathan Jonsson's Crossword Puzzle!